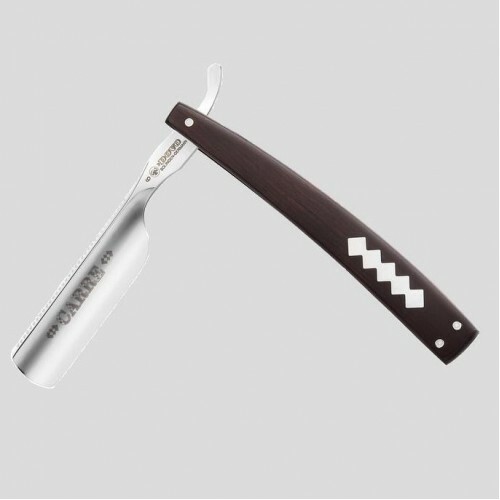 This stylish Grenadille razor has a 6/8" hollow-ground Carbon Steel blade set in Grenadille (African Blackwood) scales with a mother-of-pearl inlay. The shoulderless blade makes the Grenadille very comfortable to hold when stropping and shaving, a genuine pleasure to use. We will hone and strop this razor before we send it to you at no extra charge, so that it arrives truly shave ready. The general consensus among those who shave with cut-throat razors is they are not truly shave-ready straight from the factory (even though the manufacturers often claim that they are), so having your razor honed before use is important.